Ksport’s Circuit Pro coilover System provides the ultimate in adjustability for enthusiasts and professionals alike, who are wishing to have the maximum in performance and durability. 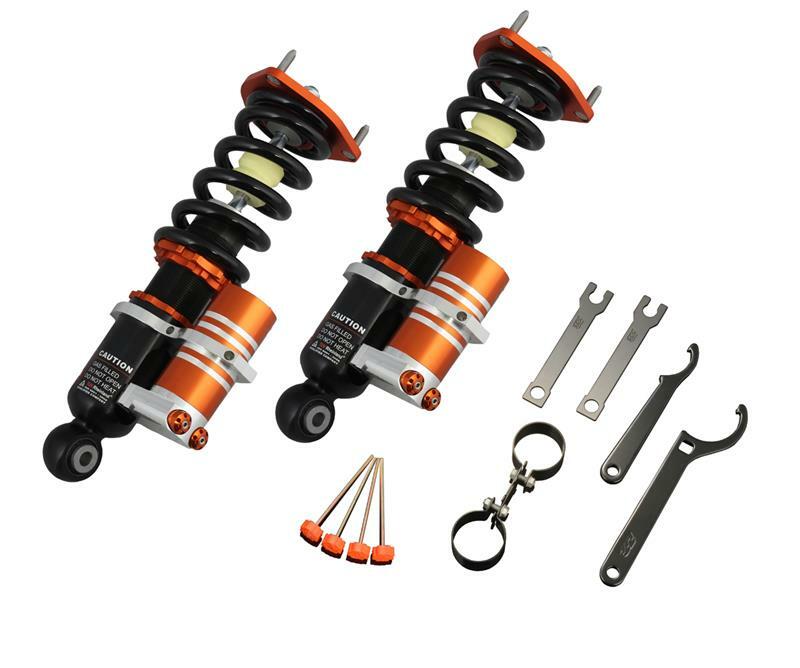 With years of engineering, testing and development, the Circuit Pro coilover System has been perfected in virtually every facet of motorsports, ranging from drifting to time attack or circuit driving. The uncompromising range of adjustability on the Circuit Pro coilover System makes it possible to win at the track, yet drive daily on the street as well. The key component to the Circuit Pro coilover System is its utilization of remote reservoirs that provide separate adjustments for rebound and compression, as well as nitrogen gas pressure. With over 860 possible settings provided by each Circuit Pro coilover System, it is possible to leave no stone unturned in the quest for ultimate performance from your vehicle’s suspension system. In addition to adjustability, the added oil capacity provided by the remote reservoirs increase the system’s ability to dissipate heat, which leads to improved performance over long periods such as endurance or tarmac racing, in addition to consistent performance throughout long heat cycles. These features, paired with 55mm monotube shocks, ensure maximum durability and consistent performance. A variety of external hardware components are available on the Ksport Circuit Pro coilover System to completely customize the system to your vehicle. When fitting this kit to your vehicle, upper mounts are available in rubber form, pillowball or Ksport’s award winning advanced pillowball mounts that offer camber and caster adjustment. Each Ksport Circuit Pro coilover System has been dyno tested individually, and the results are included with the system at the time of purchase to aid in coilover tuning.